The season is changing and the colder months are coming. Its time to make soups. But don’t just make any old soup. Lets make it healthy and amazing! 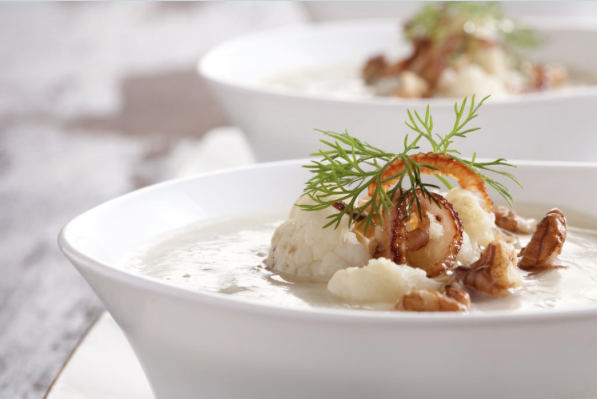 Forget all the other Cauliflower Soup recipes. This is the one for you! This recipe eliminate’s all the unhealthy stuff that people tend to crowd their cauliflower soups with. You don’t need cream to make it creamy! You don’t need potato’s. And you don’t need tins of anything. Raw and natural ingredients are best. The minimal ingredients let the delicious cauliflower flavours shine through! Cauliflower is an amazing cruciferous vegetable, often overshadowed by its green cousin broccoli. It contains an impressive array of nutrients, including vitamins, minerals, antioxidants and even protein. It is also an alkalising vegetable. Not only is it nutritious but when it is cooked it oozes with flavour and you will see how it becomes very creamy and satisfying. The result should be a deliciously full flavoured, creamy and healthy soup!